On Day1 of the trek, our guide, Chong Namgyal, showed up at our hotel promptly at 8am. We had hired a cab to take us to Raru from where we were to begin trekking. The new road connecting Padum to Darcha (in HP) will pass through the villages of Raru and Purne, both of which fall in our trekking path. As of now, work on this is ongoing and has been completed until Raru. 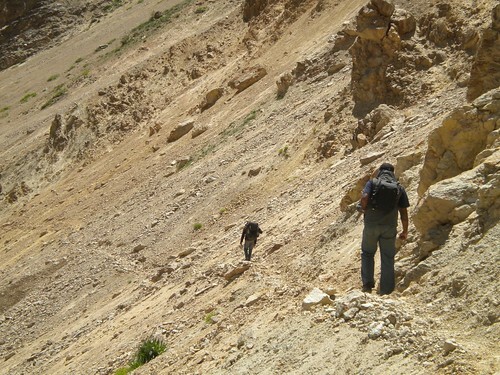 So most trekkers hitch a ride until there and then proceed on foot. However, now the road has been developed a little further south of Raru as well, so our driver took us as far as he possibly could until a large boulder blocked further progress. Here we alighted with our bags: one backpack to be carried by Chong, one daypack to be carried by me and Madhu’s camera bag. The driver promised to return 4 days later to pick us up from the same spot. Having trekked before in Himachal within the Great Himalayan National Park, this time around I didn’t have too many apprehensions about this trek. Madhu and I knew we were capable of putting in around 4 to 5 hours of walking per day easily and scaling steep trails slowly but surely. Moreover since this time around we would be staying in people’s homes, I expected the overnight stays to be more comfortable than teeny tents. The only concern was the Ladakhi weather. 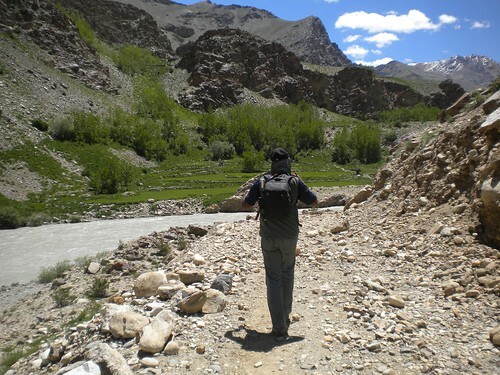 Every book or blog we read about trekking in Zanskar talked about the harsh sunlight that tends to cause sunstrokes, dehydration and sunburns. To protect ourselves as much as possible against this, Madhu and I wore broad-brimmed hats, scarves, sunglasses and loads of sunscreen. Luckily, by the end of the trek, except for a terrible tan, we didn’t suffer from any other problems! Our first day of trekking was, expectedly, quite tiring. But the most difficult part, especially for me, was 3 huge piles of snow that slid down the mountains onto the track at the beginning of our trek. Given my clumsiness, I had a tough time keeping my footing on the snow and getting across safely! After that, though, the trail eased out to a dry, muddy one. As the day wore on, the heat surprised us with its intensity and the bare trail provided no shade whatsoever. Chong kept a slow, steady pace while Madhu and I did our best to keep up with him and were not too far behind. 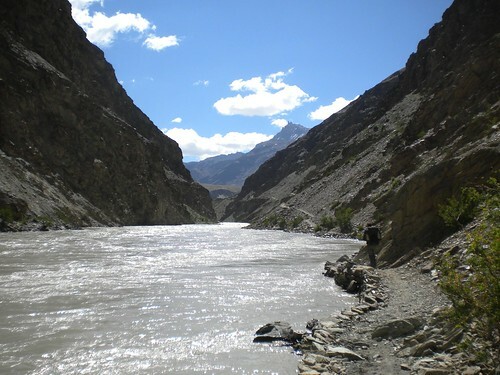 The trail ran alongside the Lungnak River, which cuts through the Zanskar range, carving out a beautiful, though bare, valley. It was a wide, rocky path, which is used by horses as well. Residents of this region commute to Padum and back on horses so that they can lug back supplies and other necessities. At the lone tea shop en route, we met a few such men who were on their way to Padum. All of us, except Chong (he had brought along a bundle of rotis) lunched on Maggi while the tea-shop owner provided us with unlimited cups of butter tea on-the-house. It was a very refreshing break! 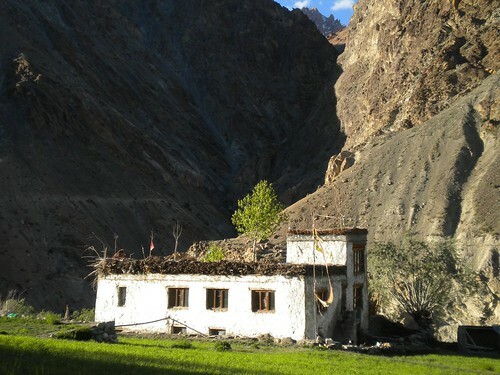 Mr. Tashi’s original itinerary had wanted us to stop at the village of Icher for the first night. However, Icher is the first village on the trek after Raru and was therefore too close to stop at for the day. So Aziz had suggested that we continue on to the village of Chatang instead, which was about 2 to 3hrs further south of Icher – I guess he had more faith in our ability to trek than Mr. Tashi ! But this also meant that we wouldn’t be able to stay at the home-stay arranged for us in Icher. Aziz had assured us that the villagers of Chatang would be more than happy to provide us with a room for the night, so we had marched on ahead to the village with confidence. But when we got there, we were completely shocked to see that the village consisted of just 2 Ladakhi homes set amidst their fields!! Chong walked up to the women working in the fields and talked to them for a while. Luckily, they did have a room to spare and escorted us there. But when we stepped into the room, I didn’t really feel all that lucky. It was the family’s ‘dump-all-junk’ room! There was a single twin-sized mattress on the floor covered with a filthy looking rug. A couple of pillows and cushions had been placed on it, propped against the wall – they looked even filthier. The rest of the space was occupied by an assortment of stuff ranging from old rugs to cabinets and broken clocks; the place hadn’t been dusted for ages. But we couldn’t complain; after all, we had barged into this family’s home uninvited! Chong sat with us for a while and then walked on to the neighboring village of Anmo, where he stayed the night with a family he was related to. We had carried just about enough water for the day from Padum. Mr. Tashi had assured us that the Ladakhi families would definitely provide us with boiled mountain water. However, Chatang did not have a clean water source nearby. The families collected water from small, shallow streams into a water-tank in front of the house. This water was muddy and didn’t look drinkable at all. Even the boiled water given to us was muddy – but since we had no other options, we drank (as little as possible) of it and silently vowed to fill our bottles at the next mountain stream we came across. These villages have no electricity at all but have been setup to trap solar energy. Our room had a single, solar-charged, light-bulb but it was enough for us to read by and relax. The family brought us a simple yet tasty meal of rice and a potato curry as dinner, which we gobbled up and then promptly fell asleep. As I lay awake listening intently for scurrying rats or other rodents (of which there were none – I’m just paranoid! ), I had mixed feelings about the day. I had absolutely enjoyed the trek and had found the landscape unbelievably beautiful. But I wasn’t loving the overnight accommodation so much – suddenly the teeny tent in Himachal felt luxurious! The following day we were woken up at 7am by a gentle knock on the day; a flask of steaming butter tea was brought in. Later after a breakfast of rotis and sweet tea, we set out on our 2nd day of trekking. But not before thanking our hosts profusely for their hospitality! When I asked one of the ladies what we owed them, they shyly conferred amongst themselves and whispered that Rs.300 would work. I gratefully pressed a Rs.500 note in one of their palms and left. The walk to Purne was a little more tiring than the previous day. We continued along the Lungnak river’s left bank but this time the trail climbed steeply at places and then descended almost to the level of the water, only to climb back high again. Chong mentioned that as the summer progressed, the melting snow water would increase the level of the river and cause parts of the low-lying trail to submerge! This time, too, thankfully, one of the villages en route had a tea stall, where we stopped for a break. The break gave us a few minutes out of the sun and that was more of a relief than the tea itself. The owner of the place was busy building a new room, which could be let out to travelers for overnight stay. His kids ran around playfully and kept us entertained with their antics. Since we had started out early from Chatang, we got to Purne just after 1pm, in time for lunch! We were told that Purne had a guesthouse where we could stay in comfort. So we were expecting a decent-sized village but again Purne turned out to be made up of just 2 homes! As we walked over, my heart sank thinking that we were in for another night like the previous one ‘coz I couldn’t imagine how such a tiny hamlet could have a guesthouse! But thankfully, there was a guesthouse. It was managed by one of the resident families. It was not completely built but some rooms were being let out. Of these, one double-room was taken up by a bunch of migrant laborers who were working on building something in the village. We were given a double-room across from them. It turned out to be a nice one with twin mattresses along 3 walls and each covered with a neat rug. There were traditional, low, Ladakhi tables placed in the front of each mattress as well. 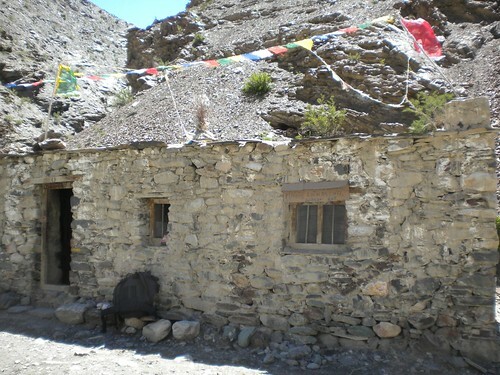 A couple of Ladakhi-style common toilets were outside to the left of the guesthouse. We were relieved with the neatness of the place! 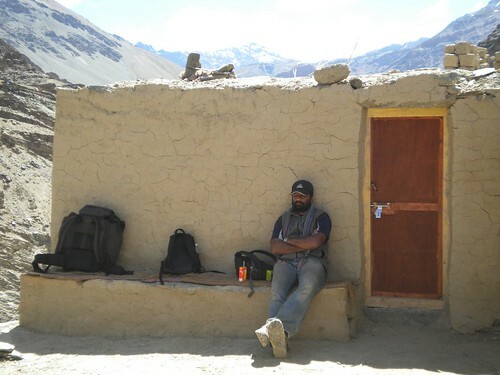 A word about Ladakhi toilets: At first, I was horrified at the thought of using a pit-style toilet and was dreading the experience. In fact, I thought that ‘going outdoors’ as we had in Himachal would be much more preferred. However, I was in for a surprise! The eco-friendly Ladakhi toilets are small rooms with pits that are very, very deep; deep enough not to cause any unpleasant sights or smell. Moreover, after doing one’s business, one is expected to shovel mud into the pit for which piles of mud and a shovel are placed thoughtfully in one corner. This ensures that the decomposition happens effectively. Overall, we were pretty impressed! Unlike Chatang, Purne is a pretty little village set beautifully on the banks of the Lungnak river. It is a junction where trekkers on their way to Darcha or Phuktal stop for the night and therefore, is usually buzzing with people throughout the summer. The family that runs the guesthouse owns the modest fields that surround their homes as well. Apart from the guesthouse they run a small store, which stocks essentials such as soap, toilet paper and bottled water; we were thrilled! The water was near its expiration date but definitely better than what we had been drinking until then. For meals, we were given the option of being served in our room or eating with the family in their kitchen. Of course, we opted to eat with the family! 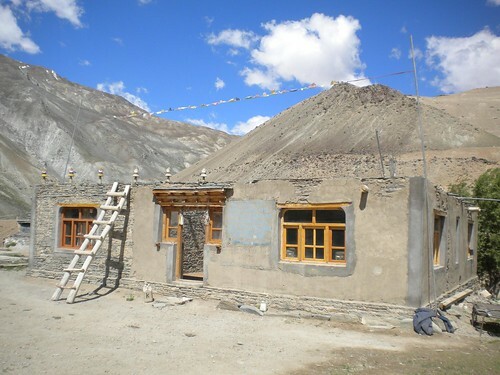 Ladakhi homes are pretty typical in structure. The living quarters are usually on the upper floor. Steep, narrow stairs on the front of the house lead to the main door, which leads into a corridor with small rooms on either side. The kitchen is usually at the far end of the corridor and is the largest of all them in the house. It serves as a family room as well. A large stove sits in the center of the room while mattresses and low tables line 2 walls to allow family members to sit around, enjoying the warmth of the stove. We sat here along with our host’s family and other visitors for all our meals and enjoyed every single one of them. Not only was the food always nice (we were served dried mutton meat once!) but the company of the Ladakhis was most special. Every evening at the Purne host’s kitchen began with cups of Chhang, which is a toddy-like drink made of fermented barley. We were served with it as well and Madhu took a real liking to it! What surprised me was that women drank along with the men without any of the discrimination that I have seen in our urban Indian societies. The hosts never allowed the cups of the visitors to drain throughout the evening causing some of them, including our guide, Chong, to look quite happy and flushed by the time dinner was served. This stay in Purne completely took away the disappointment we had faced in Chatang the previous night. This is the kind of experience we were looking for and we’re so grateful to the Ladakhis for letting us have it! WOW!! WOW!! WOW! I’ll venture that path.. someday!! Wow. That’s an amazing trek. Someday…I hope to be there.